Kick off your visit on the 19th (Fri): shop like a local with Exposures International Gallery of Fine Art and then soothe aching muscles at some of the top local wellness centers. 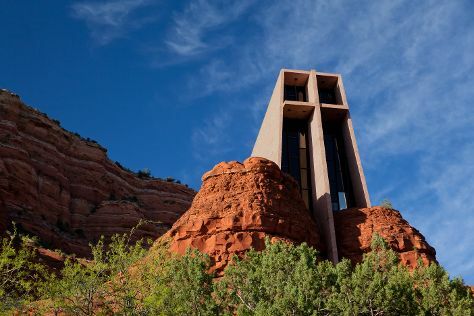 Get ready for a full day of sightseeing on the next day: explore the striking landscape at Cathedral Rock, then contemplate in the serene atmosphere at Chapel of the Holy Cross, and then take in the spiritual surroundings of Amitabha Stupa & Peace Park. To see reviews, ratings, more things to do, and other tourist information, use the Sedona route website . Atlanta to Sedona is an approximately 8-hour combination of flight and taxi. You can also do a combination of flight and shuttle; or drive. The time zone changes from Eastern Standard Time to Mountain Standard Time, which is usually a -2 hour difference. Expect a bit cooler evenings in Sedona when traveling from Atlanta in April, with lows around 48°F. Finish up your sightseeing early on the 20th (Sat) so you can go by car to Grand Canyon National Park. On the 21st (Sun), take in a show at Hopi House, then contemplate the long history of Hermit's Rest, then explore the stunning scenery at Grand Canyon South Rim, and finally take in breathtaking views at Yavapai Point. For photos, more things to do, traveler tips, and other tourist information, refer to the Grand Canyon National Park day trip planner. Drive from Sedona to Grand Canyon National Park in 2.5 hours. When traveling from Sedona in April, plan for a bit cooler days and cooler nights in Grand Canyon National Park: temperatures range from 62°F by day to 26°F at night. Finish up your sightseeing early on the 21st (Sun) so you can go by car to Phoenix. Phoenix is the capital and most populous city of the U.S. Start off your visit on the 22nd (Mon): take in nature's colorful creations at Desert Botanical Garden and then learn about winemaking at Aridus Wine Company. To find ratings, reviews, traveler tips, and other tourist information, read Phoenix trip builder website . Traveling by car from Grand Canyon National Park to Phoenix takes 4 hours. Expect much hotter temperatures when traveling from Grand Canyon National Park in April; daily highs in Phoenix reach 88°F and lows reach 62°F. Wrap up your sightseeing by early afternoon on the 22nd (Mon) to allow enough time to travel back home.